The majority of users today hop online primarily to visit social networks and stay connected with friends and family. As such, developers are gearing more and more towards stitching together all of those social media experiences into the clients and applications we use most. Microsoft is no different. 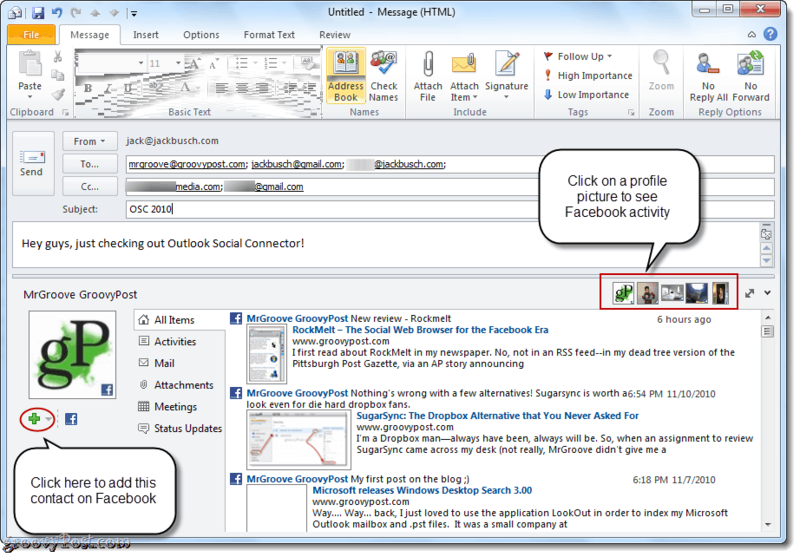 The Microsoft Outlook 2010 Beta saw the introduction of the Outlook Social Connector, which incorporated the People Pane into your messages. The People Pane makes email more social and more personal by including profile pictures of your contacts as well as status updates and other social media activity. In the beginning, there weren’t any compelling social network providers for Outlook Social Connector, which made the People Pane promising, but extraneous for the time being. As such, grooveDexter showed you all How to Disable the People Pane in Outlook 2010. 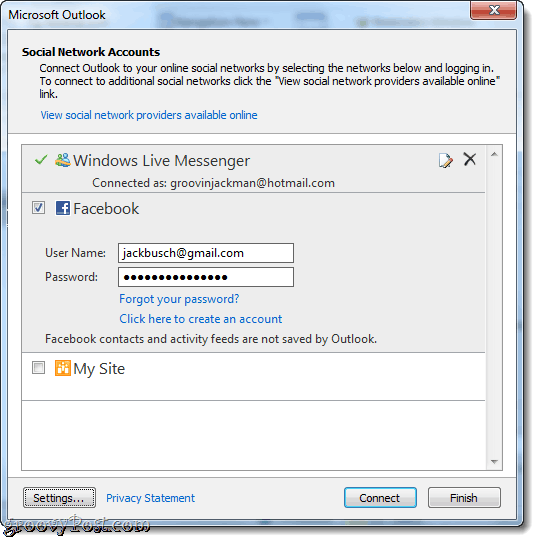 But now, Microsoft has released the Microsoft Outlook Social Connector Provider for Facebook and the Microsoft Outlook Social Connector Provider for Windows Live Messenger, which means it’s time to re-enable that People Pane and get connected. Here’s how to connect your Facebook account to Outlook using the Outlook Social Connector. 1. Install Outlook Social Connector. If you are running Outlook 2010, Outlook Social Connector will download via Microsoft Update. If you are running Microsoft Outlook 2003 or Microsoft Outlook 2007, you can download the Outlook Social Connector at the Microsoft Download Center. 2. 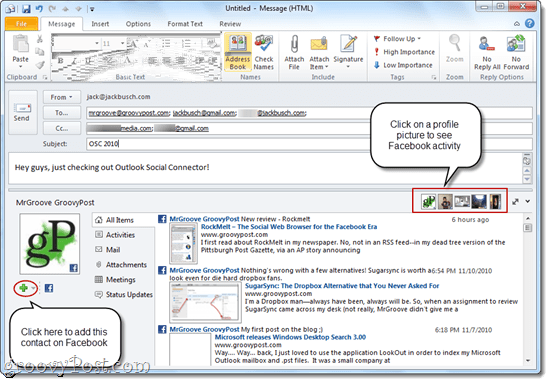 Download and install the Microsoft Outlook Social Connector Provider for Facebook. Make sure you get the right version—there is an x86 version and a 64 bit version. While you’re at it, you can grab the Microsoft Outlook Social Connector Provider for Windows Live Messenger. 3. Launch Outlook and click the View tab. Click on People Pane and make sure that Normal is checked. Next, click Account Settings. 4. Check the boxes next to the social network accounts you’d like to add. You’ll be asked to enter your user name and password. This is the same user name and password you’d use to log in to the social network directly. Press enter to connect your accounts and click Finish when you’re done. 5. Now, when you view or compose a message to someone who is on one of your connected social networks, you can see their activity, profile picture and status updates. If you are sending a message to multiple recipients, you can switch between which Facebook profile you’re viewing by clicking their photo in the top-right corner of the People Pane. 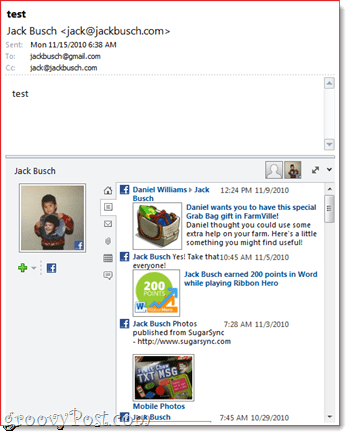 If you haven’t already added a particular contact on Facebook or Windows Live Messenger or any other of your connected social networks, you can do so right from the People Pane by clicking the Plus Sign. The amount of information you see depends on the sharing and privacy settings that the user has set up on the social network itself. For example, if you are emailing someone who isn’t your Facebook friend, the only information that you will see is what has already been shared publicly. On the other hand, if you are a friends on Facebook, as MrGroove and I are, you can see everything that they’ve shared with their friends, including wall posts, profile pictures and status updates. Separately, the People Pane also gives you a conversation history for each contact. Here, you can see your past email messages, meetings and attachments at a glance. That may come in handy if you’re about to email a client and you can’t remember if you already sent them an invoice or proof. So, there you have it—Outlook is now more than an email, calendar and tasks client; it’s a social media connector as well. After you get the Facebook provider up and running on Outlook Social Connector,you ought to check out the other Outlook Social Connector partners as well, which includes LinkedIn and MySpace. Apologies if this has already been canvassed. Two issues – one minor and one major. First the minor: This script CC’s instead of BCC’s. However this seems to have been thoroughly addressed so I can do my own research on that one. Major: How the heck do I turn it off? I need this script to just not be a thing at all anymore. But I cannot for the life of me figure out how to stop it. I’ve erased the script and saved, I’ve gone in and deleted the .otb files, done a total revo uninstall and reinstall of all office 365. Still the script continues to run… please help?